“Really?” I replied, trying to hide my disappointment. Pamela, one of the owners of Robinson’s Farm, was just as friendly as I had imagined her after we spoke in November. At the time, I wanted to visit the farm with Delphine, for the Envoyé Spécial la suite TV program she was working on with me. I felt sad that Delphine, Cyril and I never made it to visit the farm in November–although our lobster trip was *really* good and made up for it–so I made a mental note of what Pamela had said. J’irai au printemps (I’ll go in the spring), I told myself, determined not to give up. Je veux vraiment voir cette ferme (I really want to see this farm). 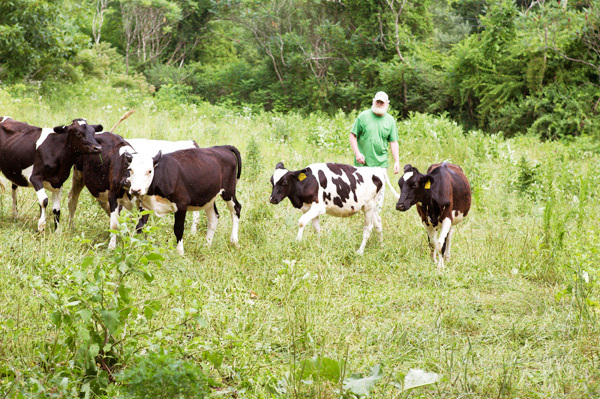 Because at Robinson’s farm, they make raw milk. And are starting to make cheese too. Both of which really piqued my curiosity. But spring came and I was away. Then summer followed naturally and I wasn’t sure it would still be a good idea to go to the farm. Maybe it was going to be too hot then and the cows would have traveled to an exotic place where they’d be cooling off…who knows what cows have on their mind? “Can I bring Lulu?” I went on. That was how it started. And that was how, two weeks ago, I finally made it to visit Robinson’s farm. I didn’t go alone–and I was glad. I wanted that my Lulu could run around on the farm, and that she saw cows and calves, trees and vegetables, chicken and eggs. So not only did my beautiful princess come along (did I already tell you that we’ve not yet spent one day away from each other? ), but a dear friend of mine decided to accompany us with her son. We packed a tasty picnic made of quinoa salad, sandwiches, watermelon and financiers I’d baked the night before, and after a two hour drive, we arrived at Pamela and Ray’s doorstep. We had an amazing lunch. And a memorable day. 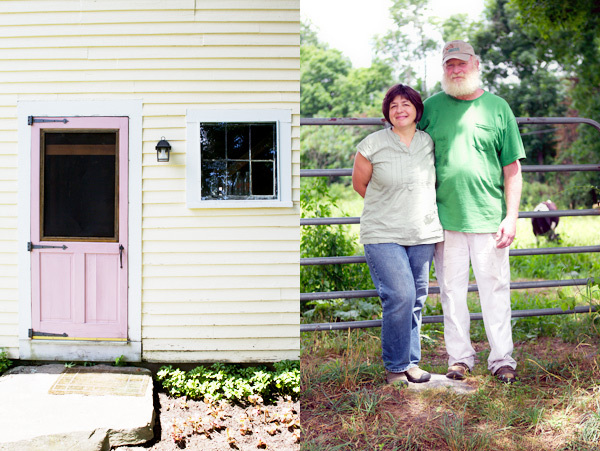 The Robinsons live in rural Hardwick, a small town west of Boston, and they have been farming since 1892. “Four generations,” Ray had said proudly when I’d asked how old the farm was. I had not yet visited this part of the state and wasn’t really sure what to expect. As soon as I arrived, though, and caught sight of the large red barn with balls of hay and cows grazing in the fields nearby, I felt relaxed. Taking a deep breath in and closing my eyes for a minute, I could almost imagine that I’d been transported back home. This rural setting is suggestive of a slow pace of life. Yet, people on the farm work hard. Long hours. Whether it’s dry, humid or raining, hot or cold–no matter what the weather decides to be. Pamela and Ray own a forty-cow pasture based herd comprised of primarily registered and grade Holsteins, with cross breeding practices which include New Zealand Holsteins, Jersey & Normande breeds. They’ve been making raw milk for five years now and like it this way. They believe that clean, fresh milk from grass fed cows provides all of the nourishment nature intended without destroying the enzymes and probiotics that assist with digestion. 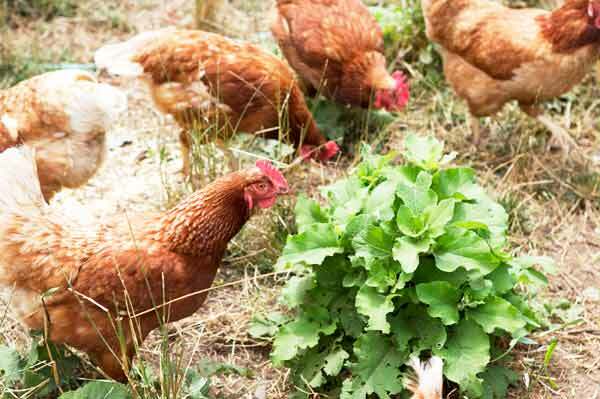 They are fully certified organic, which means that the pastures, hay, chickens, eggs, perennials, and herd found on the farm are organic. Every summer, they grow vegetables and flowers they sell at local farmer’s markets or at their farm stand, along with grass fed beef, “rose” veal and yogurt from Sidehill Farm (which is made with their milk). And this coming fall, they hope to sell their cheese too. They told me that they’ve been making cheese for a while now and are keen to continue. 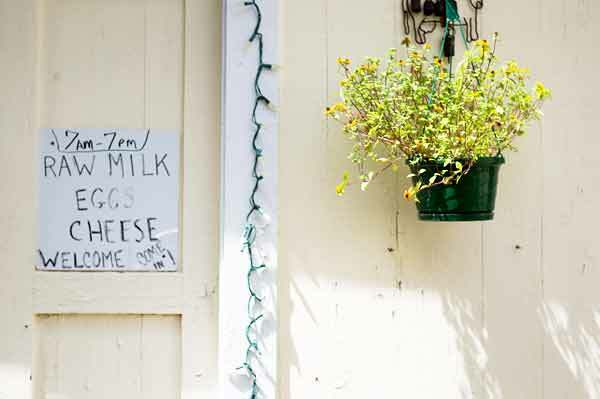 If you visit the farm, you’ll be able to taste their practice cheese. We did. We had just settled for our picnic lunch at the back of the farm when Pamela brought a large platter of cheese for us to enjoy. I quickly noticed that every time she’d walk by the wooden table where we sat to eat, she’d nonchalantly grab a slice of cheese. “I saw you!” I exclaimed jokingly, seeing she was putting cheese in her mouth. “You’re snacking on cheese all day long, aren’t you?” I added. She laughed. We sampled a few types of hard cheese: Robinson Family Swiss, Tekenink Tomme, Hardwick Stone (brick) and a Barndance (abondance). We could not stop eating. Lulu, ma petite gourmande, neither. The cheese was tasty. It was the perfect food to accompany our lunch. After lunch, we also had a tour of the farm. We walked through Pamela’s large vegetable garden that gave me real vegetable envy; we saw where they make raw milk and cheese; we met the calves and cows who were smartly gathered in the shade of tall trees; and we visited the chicken. “Lulu isn’t scared at all! Pamela exclaimed when we stepped inside the hen house to collect a basket of fresh eggs. “That’s right!” my friend E., who was holding Lulu by the hand, went on. “Can we have some milk?” I asked. Before leaving, we packed a gallon of raw milk, a large container of yogurt and three pieces of cheese each. We were happy. We’d spent a simple fulfilling day. I was keen to taste the milk to find out whether it would taste like the one I’d grown up with. 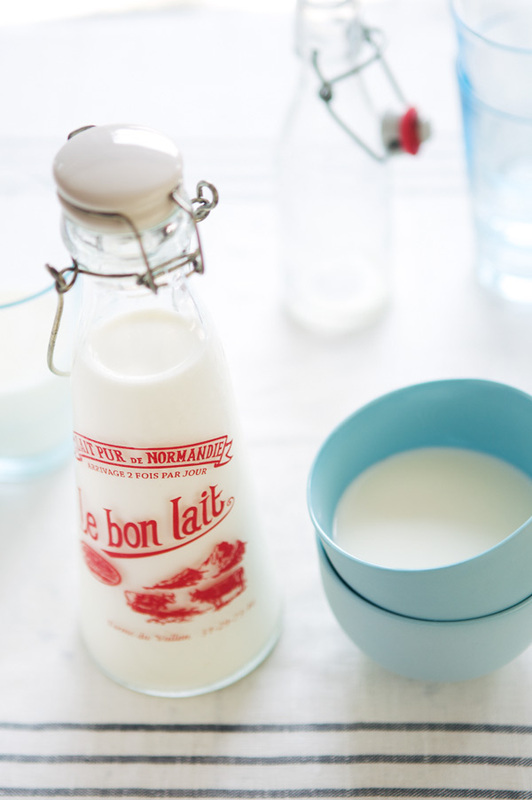 At my grandparents’ or my parents’ house, le lait cru (raw milk) was what we’d drink. “Qu’est-ce que tu vas faire avec tout cela?” (What are you going to make with all of this?) E. asked when we were back in the car. “Je ne sais pas encore,” (Don’t know yet) I said. But it didn’t last for long. Back home, ideas started to come. I was going to bake a herb-scented vegetable tart, a variant of this one that followed my inspiration. And small cute ones for Lulu too. 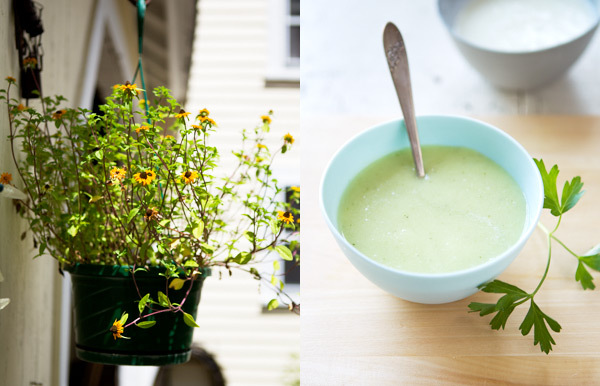 Prepare a melon and cucumber soup with yogurt and fresh herbs from the garden. In the morning, drink milk with a batch of homemade granola. 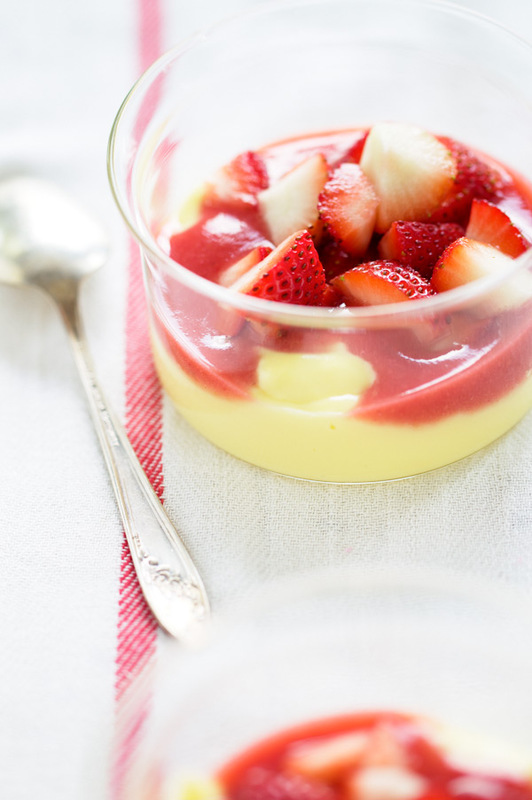 And make a vanilla-flavored custard, and serve it in verrines with strawberries sauce and fresh strawberries–a dessert I frankly have a strong weakness for and could eat every day! All of these foods tasted like summer, no exception. To my dear local readers…if you know of a farm that you think is a worth of a visit, leave me a comment to let me know. I am always *so* keen to learn of new places…And take Lulu around. To make the strawberries sauce, place all the ingredients in a blender or food processor and purée finely; set aside. To make the custard, in a pot, bring the milk and vanilla to a simmer. In the meantime, combine the eggs, egg yolks and sugar in a bowl and beat until homogeneous. Add the salt and cornstarch. Pour the hot milk slowly in while stirring. Transfer the custard to the pot and heat again. When you’ve reached a simmering point and small bubbles form at the surface, cook the custard for 1 minute while stirring–it’s going to thicken and coat the spoon, a sign that it’s ready. Transfer the custard to a large bowl placed in a iced bath. Stir occasionally to prevent that a skin forms at the surface. Let cool completely and refrigerate (if you can resist, I cannot since I love the cream lukewarm), covered, until ready to use. 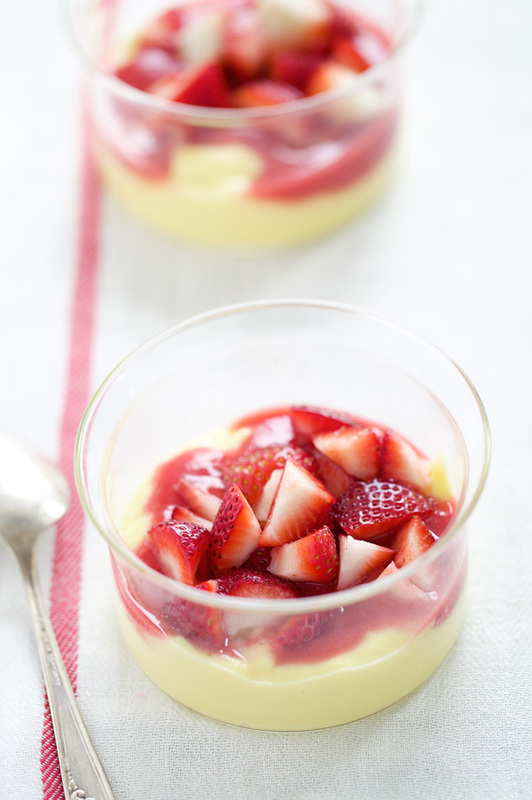 To serve, divide the vanilla custard between small glasses. Add the strawberry sauce and serve with freshly diced strawberries. Stir lightly and enjoy. It’s a simple but delicious dessert! Pour faire le coulis de fraises, mettez tous les ingrédients dans un blender et réduisez en purée fine; mettez de côté. Pour faire la crème à la vanille, faites chauffer le lait et la vanille dans une casserole. Pendant ce temps, battez les oeufs, les jaunes d’oeuf et le sucre dans une jatte. Ajoutez le sel et la maïzena. Versez le lait chaud tout en remuant. Transférez la crème dans la casserole et faites à nouveau chauffer. Une fois que de petites bulles se forment à la surface, cuisez la crème pendant 1 minute sans cesser de remuer–la crème est prête quand elle épaissit et nappe bien la cuiller. Transférez la crème dans un bol placé dans de l’eau glacée. Remuez de temps en temps pour éviter qu’une croûte ne se forme. Laissez complètement refroidir et couvrez. Mettez en attente au frigo (j’ai pour ma part du mal à attendre car j’aime la crème tiède !) Pour servir, versez la crème dans de petits verres. Nappez de coulis de fraises et servez avec les dés de fraises. Mélangez un peu et dégustez! C’est tout simple mais délicieux. 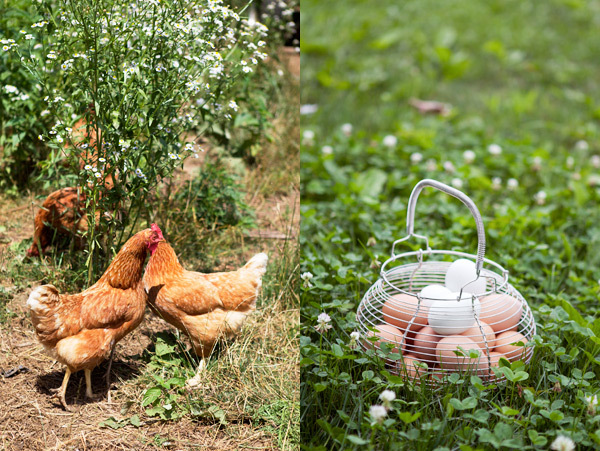 This is an incredible farm, and you’ve captured the spirit of it beautifully in these pictures! It’s quite a shame, but I’ve never tasted raw milk. I can only imagine how heavenly it must taste. What a beautiful post! Lulu is so beautiful 🙂 Thank you so much for sharing your experience. We’re also lucky to have an organic farm nearby where we get raw milk and wonderful eggs, but the sad part is that our state requires the label “not for human consumption” to be on those products. 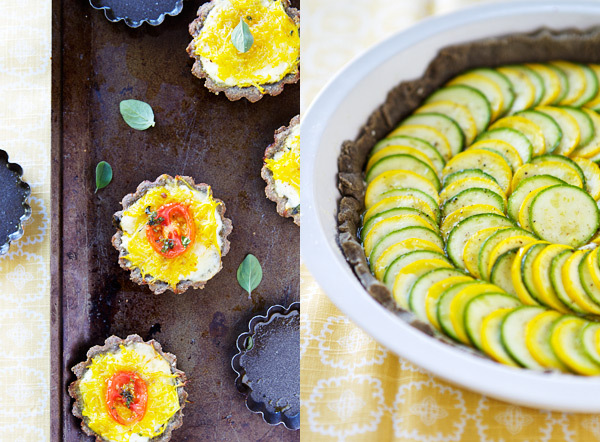 I’ll have to say that the Zucchini Tart looks just delicious. Thank you for the beautiful post! 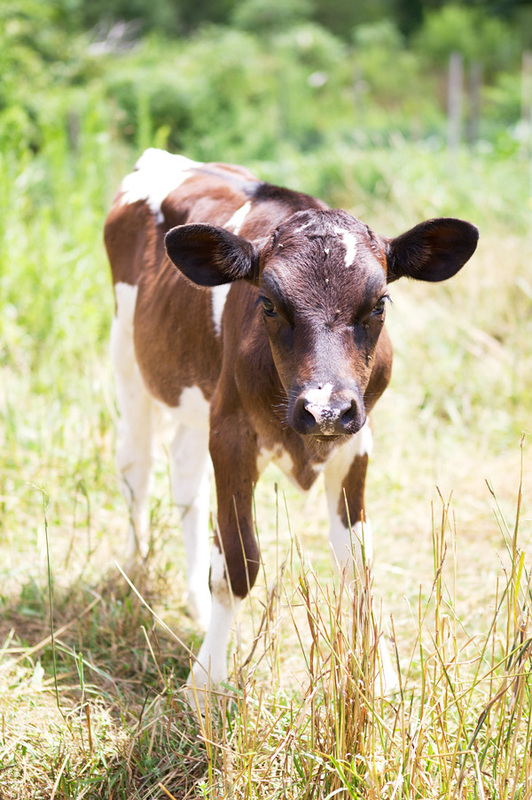 Lulu is growing up quickly, she’s so cute!…Wonderful farm, everything that comes directly from nature tastes different. Raw milk is something we love too, now that you reminded me I will have to find some! Gorgeous post, and how precious little Lulu is! We are lucky to be able to get raw milk across India, and I set fresh yogurt at home every alternative day. I love the verrines. Trying to find time to make them with peaches or mangoes. They are lovely! quel bel article … Lulu a du s’éclater à la ferme ! This all looks so amazing. I wish that I could find a farm with raw organic cow’s milk in Spain, where I live. I will begin my search! As always, such lovely pictures! 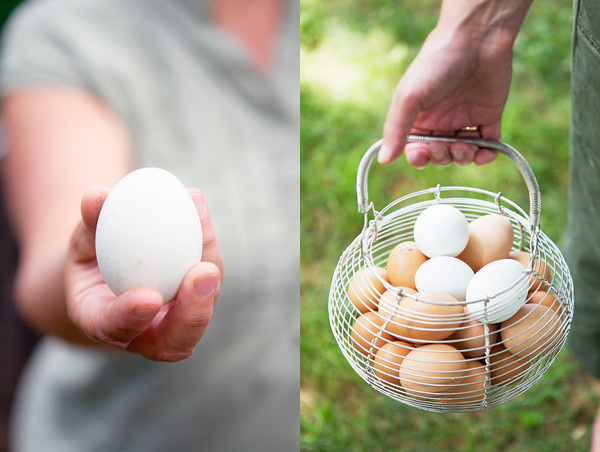 There are two organic farms south of Boston that I love- Weir River Farm in Hingham and Holly Hill Farm in Cohasset. Weir River has a story hour for children(I believe it is held on Wednesdays) and they have cows, horses, chickens, and pigs as well as vegetables. 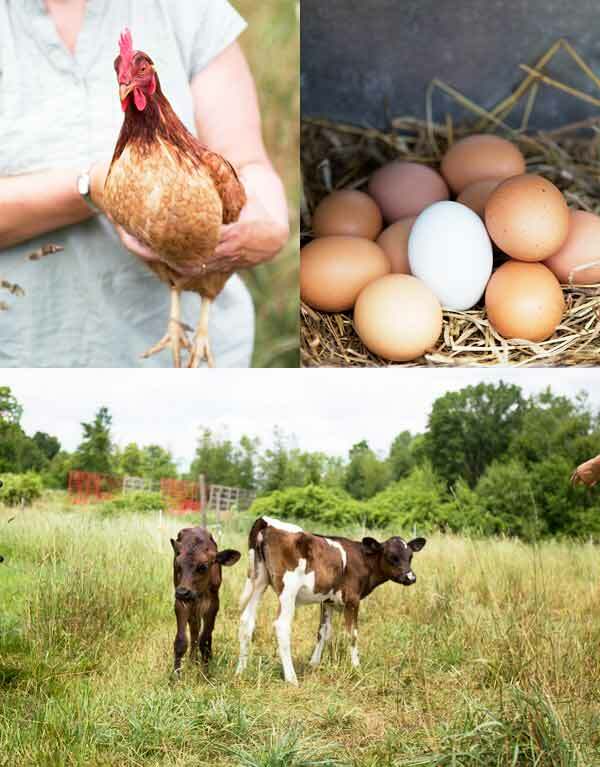 Holly Hill has wonderful veggies, a pony and chickens, many educational programs and, once a month, you can purchase wonderful pork and beef raised at Brown Boar Farm in Vermont. Oh my, this has reminded me how much I adore custards. Viens faire un tour chez nous. Can you tell me what defines a verrine? When I was in Paris last month, I noticed many cookbooks with many recipes for them, some of which were savory and some of which were sweet. I have recently found a source for raw milk, after reading of its many health benefits. It is so sweet and flavorful compared to milk from the grocery store. I use it for making yogurt and ice cream. Your photos are lovely. Thank you for sharing this outing with us. Lovely post, photos and recipes. I also grew up on raw milk and I must say that I still remember how flavorful and creamy it was. Perhaps there’s a time, not too far in the future, when more people will have access to raw milk and raw milk products. Something good to wish for and support. I’ve been having a blast with the strawberries around here at this time of the year Bea, and the more recipes to try, the better! Your daughter is absolutely adorable – I love seeing photos of her here! Superbes photos, superbe billet! Que des bons mots à dire! Here in Tennessee, we are part of a cow-share program which allows us to buy fresh, raw milk from a wonderful Amish farmer. Unfortunately, in so many parts of the USA, it’s illegal! But the milk is SOOOO wonderful, and I am completely convinced of the health benefits…after all, we must consume things as nature intended, not after it’s been altered to a state of who-knows-what in a factory, right? This post reminds me of why I love living in the country so much! 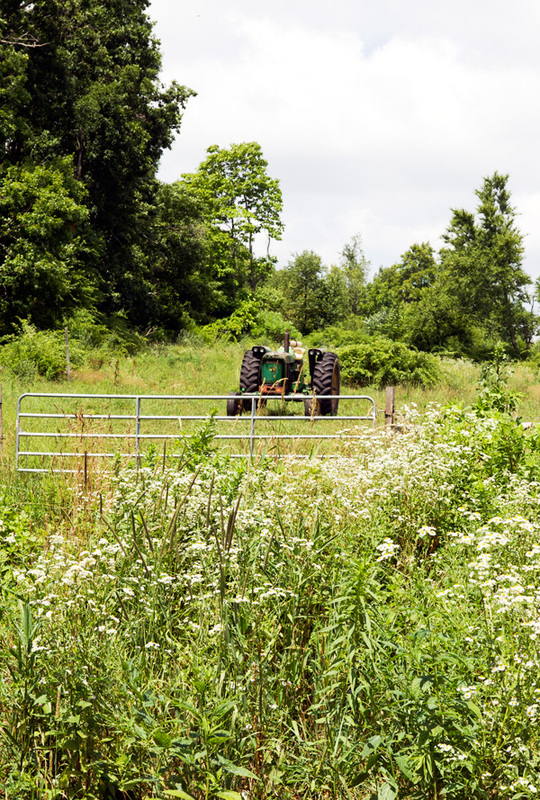 We are surrounded by local farmers and cows and horses…Thank you! J’ai envie de partir à la campagne. Merci Béatrice pour ces photos tout simplement superbes. Ever so lovely post, as always! I remember a farmer who a cute stand at the Quais de Saône market in Lyon: he had raw milk (and lovely goat cheeses, butter and eggs)… That milk was divine, and made the most beautiful petits pots. We enjoyed le lait cru, and fresh baked chocolate chip cookies, at Taylor Farm in Vermont. We keep going back there, the cheese, the setting, the people make the trip worthwhile. I had a friend who was lactose intolerant – badly. Yet when he only has a little bit of raw milk, he’s fine. Odd. Thanks for the recipe – I’ll have to try it out on him! I love raw milk. Not only it is an important nourishing food, but it is also delicious! Your pictures of the cows were beautiful, and that cheese looks to DIE for. Ooooooo, a field trip, with cheese! What could be better! this totally stole my heart! come out to western ma and visit upinngil farm in gill (just off rt 2). 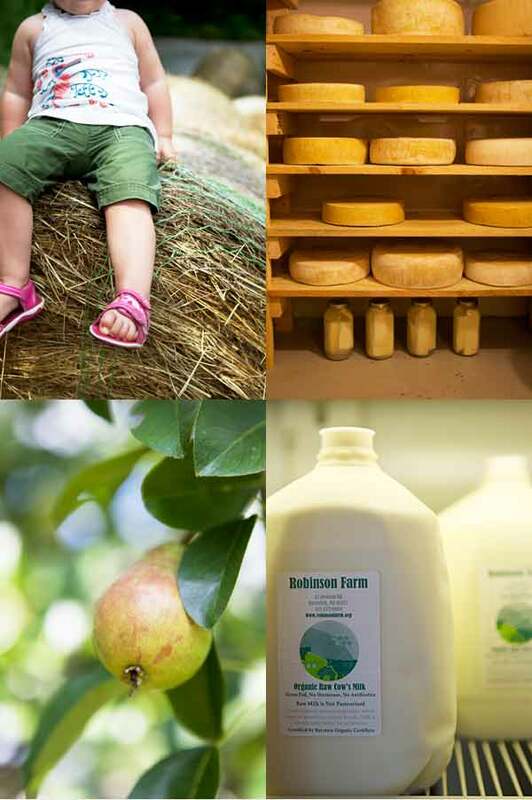 it is a sweet, beautiful farm selling delicious raw milk, cheese, berries, honey & veggies. the land is stunning and the family who owns the farm is very welcoming. Brings me back to Enniskerry, outside Dublin, where we went each summer. I would be sent to the farm down the lane with a large jug and collect the raw milk. I am sure it was wonderful, but did not appreciate that as a child. 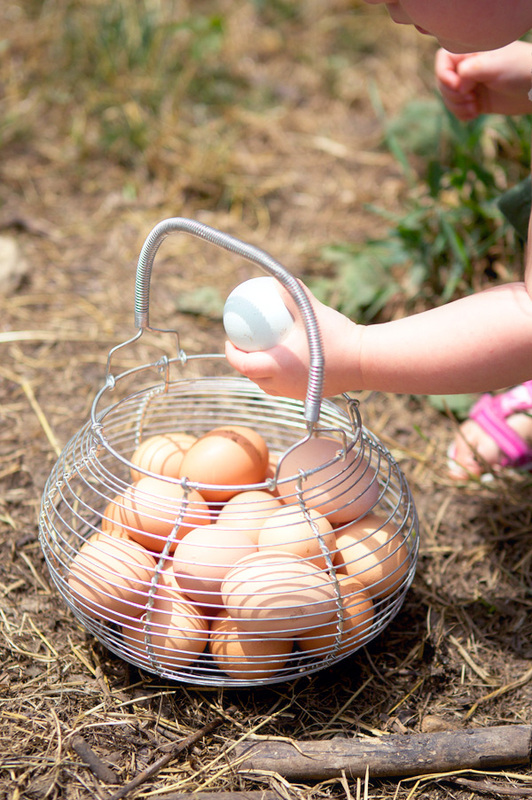 I also remember collecting the eggs. Yes, Bea, I can remember that far back! Wonderful pictures as usual. Lulu is getting so grown-up. 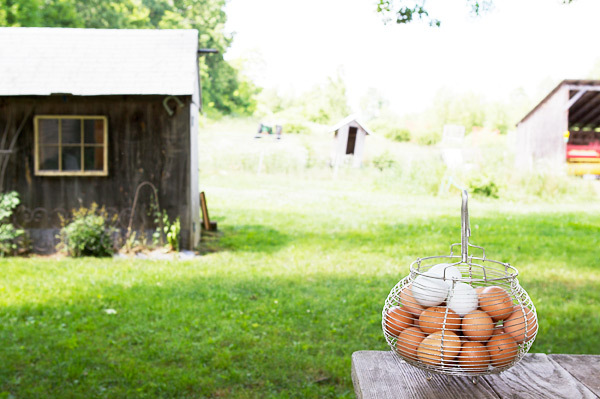 There are so many lovely farms in Southern Maine – you really don’t have to go far into Maine to get them. I’d recommend going in the fall for apple and pumpkin picking, hayrides and the foiliage! And definitely visit Shelburne Farms in Northern Vermont if you get the chance! The farm has this really lovely castle-looking building on it. It costs money to go, but my family sort of snuck in to take a walk. What a fabulous trip and fabulous post. I just loved it. I very much want to visit a farm in the area. My trip to the Napa Valley and my friend’s farm there had me wishing for more. MmH quelle belle et douce journée! Ça donne envie, et faim! merci pour cette jolie balade ! I just loved this post! 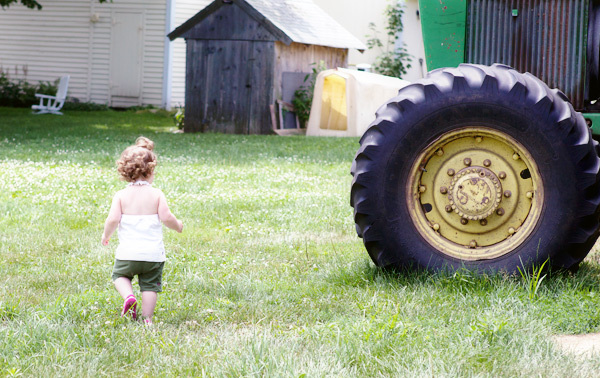 I grew up on a farm and it made me so homesick to see all of your lovely photos…. How fun! I had been considering visiting the Robinson Farm, I live maybe 45 minutes from there, in Amherst. There are a LOT of small farms in Massachusetts; in fact, many of them have small tents in Amherst’s open market, which happens every Saturday and Sunday in the early afternoon! You should really go sometime– there is fresh local fruits and vegetables, farm-made yogurt and cheese, fresh handmade bread, and pretty much anything you could hope to find at such an event. It’s great! Christine, la bouteille vient de Comptoir de famille. Quelle douceur! Merci! It was like taking a virtual vacation, what a treat. Thanks for a lovely few minutes. Thanks for bringing us along to visit this farm! I love the photos of Lulu and seeing how she’s grown a bit from the last post. Her little hands and feet are so cute! 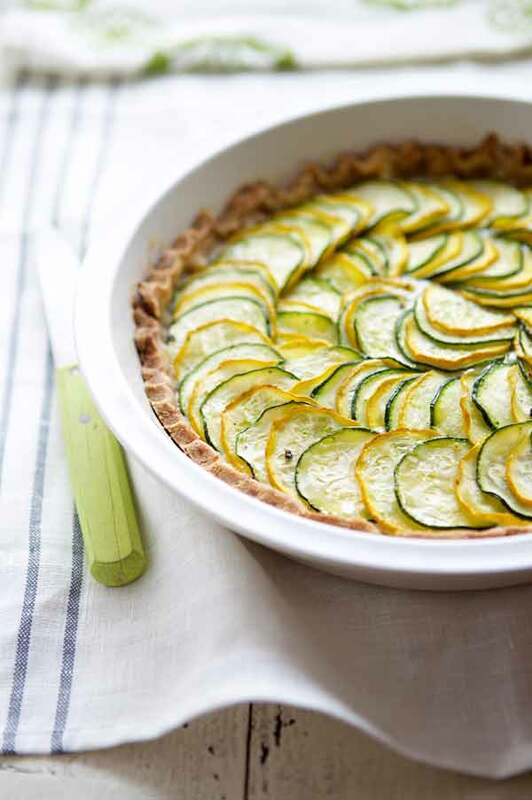 Je ne vois pas la recette de la tarte aux courgettes de ce post-ci… Serait-il possible d’avoir la recette en français? Et si pas en anglais? J’aime beaucoup ton blog! I enjoy every single visit to what always feels like… the feeling of going home. Those are beautiful photos too. As for farms, I’m still biased towards what we have in New Zealand! Your photographs are so beautiful. The farm and everything about it looks fantastic. Does it snow there in winter do you think? How long does the cold season last? Does the farmer have staff or do the two of them do all the work themselves? Newlywed, verrines is a food trend that started in France a few years ago. The idea behind was to layer food in small glasses that would look pretty. The food can be savory or sweet and is served as an appetizer, mise en bouche or dessert. Thank you everyone! I cannot wait to visit more farms in the coming months. Everything about your blog is so beautiful. 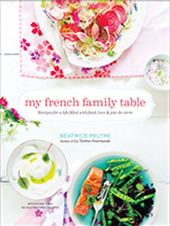 The pictures, the writing, the recipes! 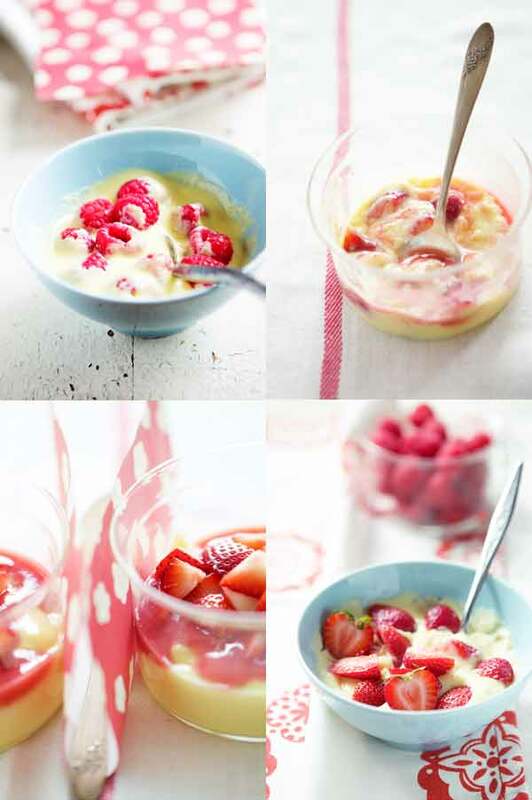 I’m looking forward to making these soon and indulging my love of everything custard-based. Mmmmmm! Normally, I love reading your blog. 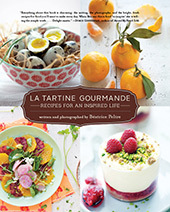 You have such beautiful photographs and recipes. Yet this entry leaves me highly concerned. There are a lot of health risks to raw milk, which include salmonella, Lysteria monocytogenes, yersinia enterocolitica, and e.coli bacteriahe. Moreover, the benefits simply cannot be backed up by science. Please read the attached link. I can understand how people want to get back to nature in this crazy, high-stress world of ours, but I think people are taking an unnecessary health risk by drinking and advocating this food trend. Thank you for your input and note. I am quite aware of the different opinions on the matter, and I will leave it to everyone to decide for themselves. For example, I, too, have no issues consuming raw milk cheese, and enjoy them a lot too. But I know not everyone would agree. Haha, maybe Jennifer thinks we should also pasteurize our breast milk? In any case, Outlook Farm in Westhampton MA is a great place to get fresh pork products as well as apples and cider. 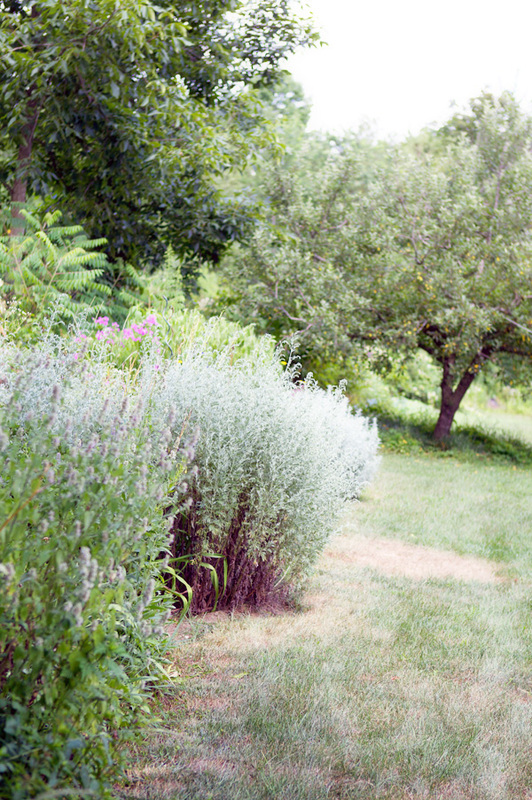 They’ve got great orchards and it’s always a lovely visit. You are so lucky to have raw milk. 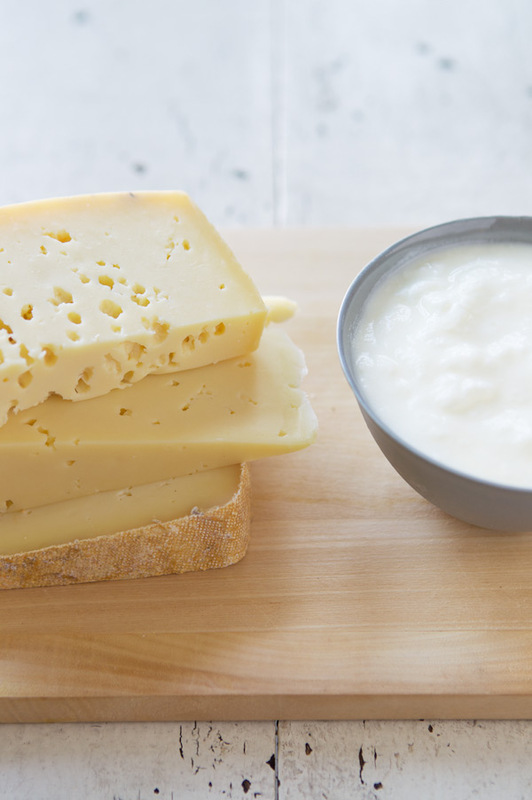 It is banned in Australia, and until very recently it was illegal to import raw-milk cheeses. No Rocquefort until 2005! It is very frustrating not to have a choice, and this issue is holding back our cheese industry. Bizarrely, pregnant women in Australia are told to avoid all soft white cheeses because of the risk of listeria, regardless of whether they are made from pasteurised milk. We like Codman Community Farm in Lincoln. Lulu would enjoy seeing the animals (chickens, cows, a dunkey, sheep, pigs…) and they sell excellent meat and fresh eggs. I’m in Paris now and I’m wondering where I’d find your pretty plastic goblets ? in all those bright beautiful colors ? Appreciate a quick response before I leave here. Thanks so much and love your blog !